You’ve seen them: those enormous multi-stack Burgers, double and triple and quadruple towers. They’re always a wonder to behold. Part of the reason is no doubt due to how precariously they stand. With so many restaurants with a multi-stack Burger on their menus, it’s a wonder how they don’t fall over on the plate. We know you’re an enterprising Burger enthusiast who is probably going to try building one of these monsters (if you haven’t already). So, we’ve identified some tips for constructing a multi-stack Burger that won’t come crumbling down. Choose Your Toppings Carefully. There are some toppings to work really well on multi-stack Burgers: cheese, the Burger builder’s glue, remains the most crucial of ingredients. But there are also some toppings that could very easily topple your tower. If you’re just a beginner (or looking to ensure Burger stability), it’s wise to avoid dense toppings such as pulled pork (and heaping scoops of most meats), slippery toppings such as tomatoes as these will sog up your buns and cause a collapse (Pro Tip: If you must use tomato, put your slices near the top, away from buns. ), and spherical toppings such as small mozzarella balls or whole grape tomatoes, etc, as they’ll roll right off your Burger. Toast Your Buns! Yes, toast them. Every single one of them. While some buns like those made from potato bread can be more durable, they too will eventually give up the good fight and deflate under the weight of your multi-stack Burger. To combat this, toast your buns on the grill until their insides are golden brown (and maybe even a little charred, if you’re into that sort of thing). Toasting your buns will make them firmer and more well defined, increasing their structural integrity. Don’t Be Afraid To Be Cheesy. Cheese is the glue to Burgers everywhere. Multi-stack Burgers would almost always fall asunder without it. That’s because the distinct sticky property of melted cheese helps adhere levels of your multi-stack Burger together while also offering killer flavor and a creamy bite. Be sure to layer your cheese slices in between each Burger patty to increase the likelihood of success. The best cheeses for this are American and cheddar, as they tend to be stickier than other cheesed when melted. Try different cheeses and see which work best for you! 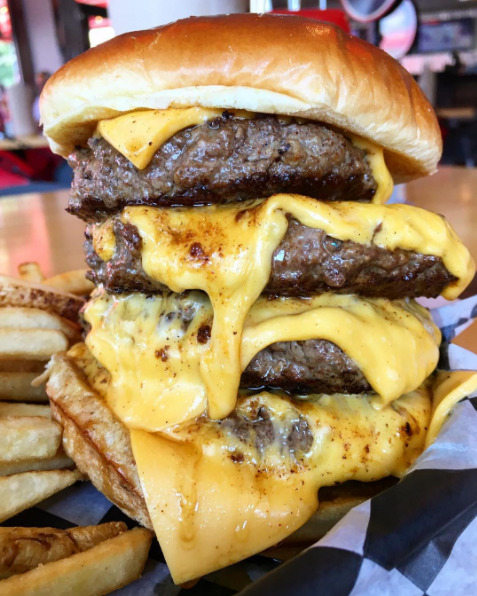 The Roadstar from American Burger Company features four Schweid & Sons Burgers layered between slices of melted American cheese. Remember, Condiments Are Friends And Food. That’s right. Where would Burgers be without the swath of condiments that usually surround them? When building a multi-stack Burger, it’s important to keep these secret Burger heroes in mind as many of them can add not just flavor but soundness to your Burger building. Creamy and stiff condiments like mayonnaise and aiolis work best. They’ll adhere to most surfaces with ease and keep some of your other toppings glued together. Consider placing them in spots devoid of melted cheese. Condiments to avoid include thin, watery sauces like Carolina-style BBQ sauce and not-so-fancy ketchup (ketchups labeled “Fancy” contain more tomato solids and less water). While these might enhance the flavor of your Burger, they’ll do nothing to keep it standing tall. Give Your Burgers A Break. One of the chief causes of Burger tower collapse is soggy buns from juicy Burgers. To combat this, make sure to let your Burgers rest on a room temperature surface for a few minutes after you’ve removed them from the grill. Letting them rest will help the juices that might otherwise spill out reincorporate with the meat as it cools. 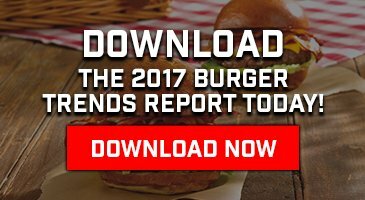 If you dump your cooked Burger straight from grill to bun, you’re more likely to witness those juices roll down and sog up your bun.